Or something like that. I’m still not sure of the point of this alleged ‘holiday;’ unless it’s just to keep Hallmark in business. Despite that, and despite the fact I do have a special someone(s) to share it with, to me it’s about the food! Ya’ll know by now that food is my life, so let’s make this day, or any other day for that matter about food. In my post on Arizona, I purposely left out the part about a cake we made for Josh’s mom. 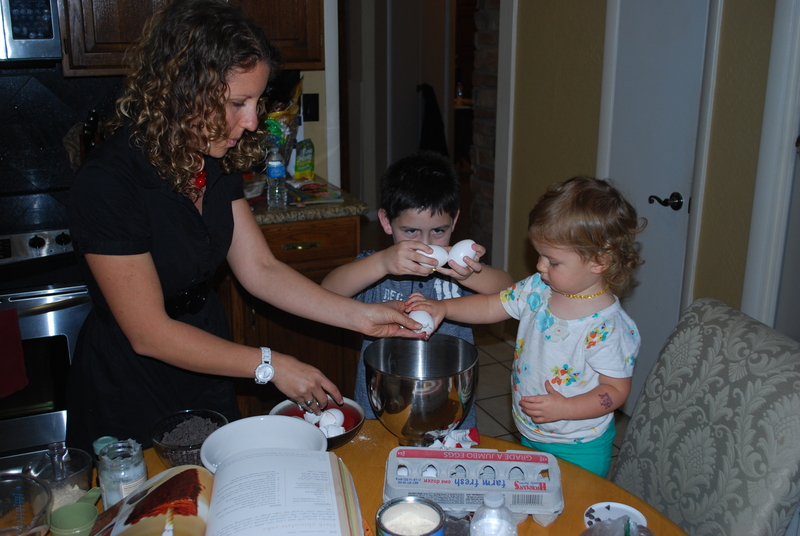 I brought 3 of my 4 Paleo cookbooks and decided on a decadent cake for the kids to make her. The cousins had a blast and I highly recommend getting little ones involved. Mind you, a two-year-old and eight-year old were my main helpers, so while it didn’t turn out the prettiest, it was quite tasty. I went with a recipe from my Make It Paleo book and it was rich a hit! 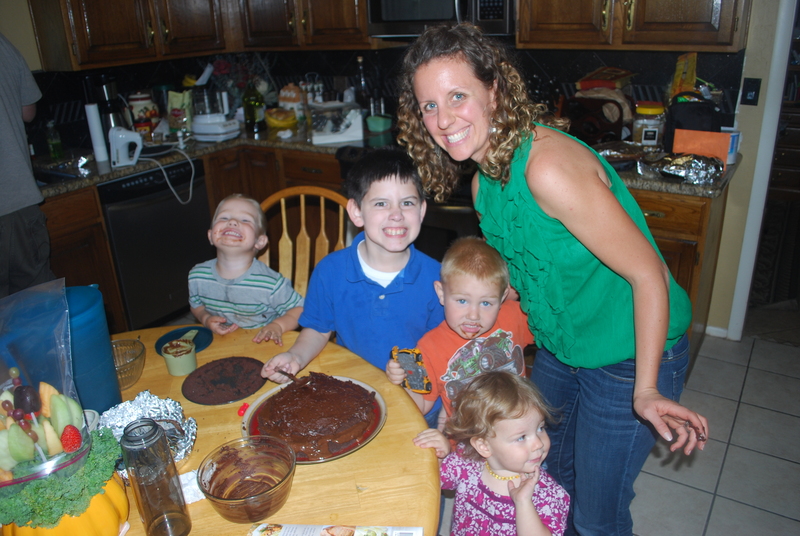 There’s nothing like seeing four cousins all get together over some chocolate cake. So, without further ado, let’s get baking. Pardon the picture; it wasn’t the prettiest of cakes due to mismatched baking pans. 2. In a small bowl, combine sifted coconut flour, cocoa powder, salt, and baking soda. 3. In a large bowl, or mixer, blend eggs, vanilla, maple syrup, and melted coconut oil. 4. Add dry ingredients to wet and blend. 5. Grease two 9-inch cake pans with coconut oil. 6. Pour batter into pans. 8. Test center with a tooth pick—if the tooth pick comes out clean, then the cakes are done. 9. Remove cakes from oven and cool. 10. Frost the middle layer of the cake with Hazelnut Frosting. 11. Frost the outside of the cake with Chocolate Ganache. 1. Place nuts and oil into food processor and blend until you have created a creamy consistency. 2. In a pot, or double boiler, melt chocolate chips over low heat. 3. Add hazelnut butter to melted chocolate chips, then remove from heat and refrigerate. 4. Place 1 cup of chilled dark chocolate hazelnut butter in a small bowl and whip with a hand mixer until fluffy. 1. In a pot or double boiler, melt chocolate chips over low heat. 2. When chips are completely melted, transfer into a small bowl and let cool for about 10 minutes. 3. Add butter or coconut oil to melted chocolate and blend with a hand mixer until combined. 4. 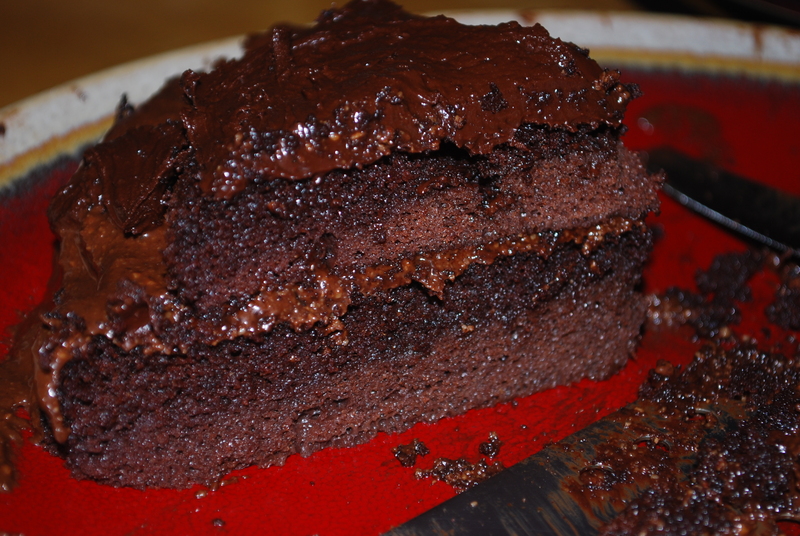 Quickly pour over cake and spread to frost while it is still warm; when it cools it hardens to a ganache. I just melted about ¼ cup chocolate chips and stirred in 1 Tbsp of coconut oil and then dipped. 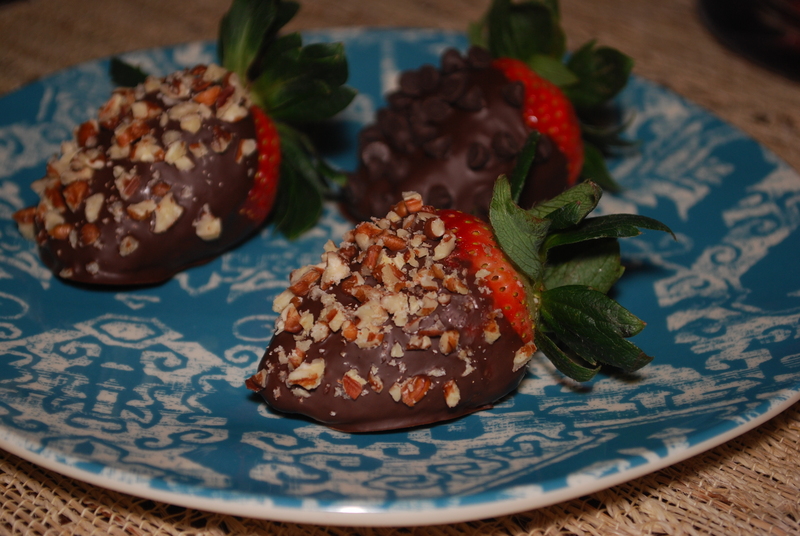 After watching a commercial for chocolate-dipped strawberries, I decided to get creative with some chopped pecans and chocolate chips. My next inspiration was from this blog. I had pinned this a while ago but never executed it…until now. I decided to sweeten the pot but brushing some pure maple syrup on them before the baking process. All I can say is DE-VINE! 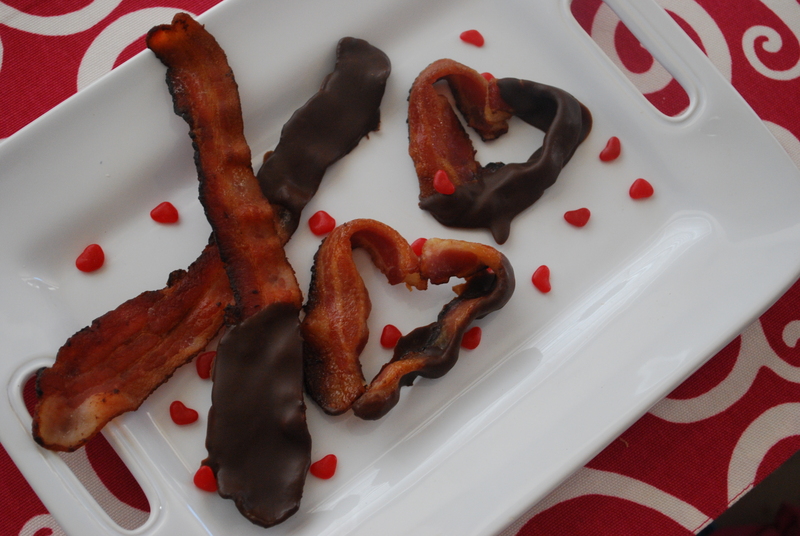 I also whipped up some plain chocolate dipped bacon just for fun. If you couldn’t tell, I was on a rampage to make sweets AND incorporate bacon. Does it get any better than that? 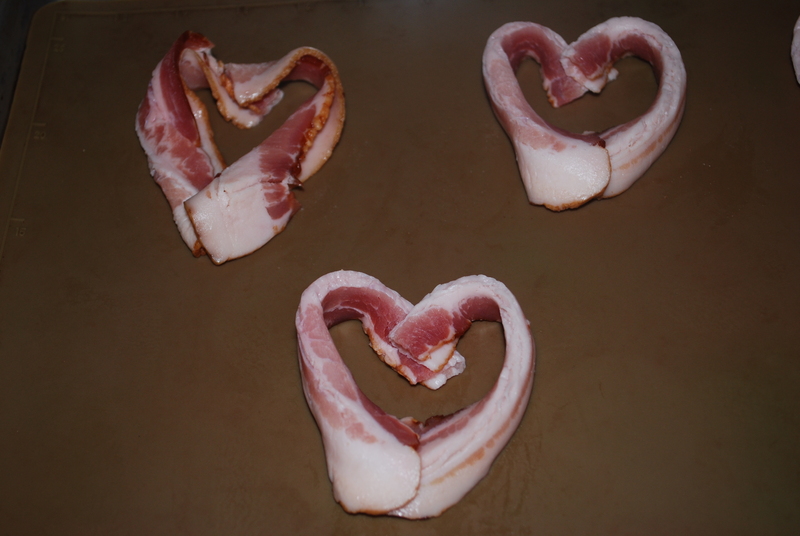 And because I couldn’t.stop.making.hearts., I kept the trend going with breakfast this morning. 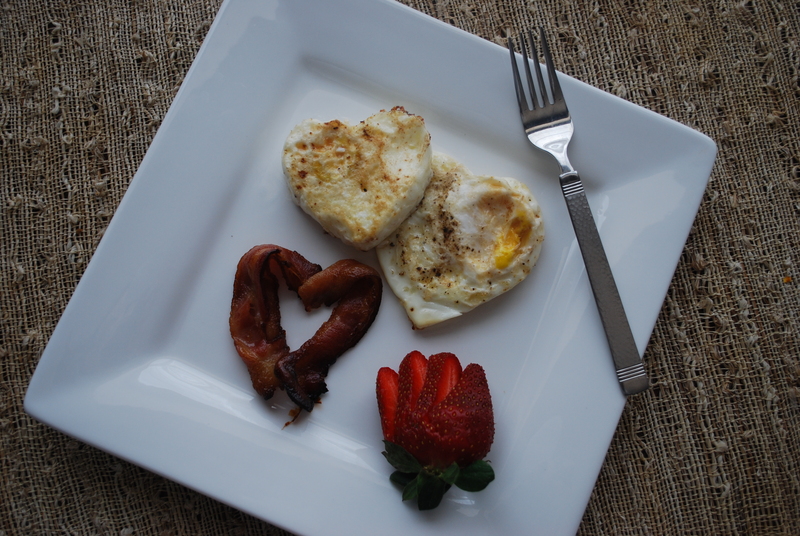 I used a heart-shaped cookie cutter I had lying around, sprayed it with some EVOO, and cooked the eggs on the griddle, in the bacon grease from the other hearts. This is the BEST bacon EVER! Here is what that looked like for Emma and me. I was going to do these heart-shaped eggs, but didn’t feel like messing with it this morning; my kitchen was crazy enough. I am still planning to make these cupcakes before Josh gets home, so I will let you know how they turn out, and add them to my recipes pages when I’m done gorging. It may seem like I’m big into Valentine’s Day, which I’m not, but any excuse to bake/cook/eat chocolate is alright with me. 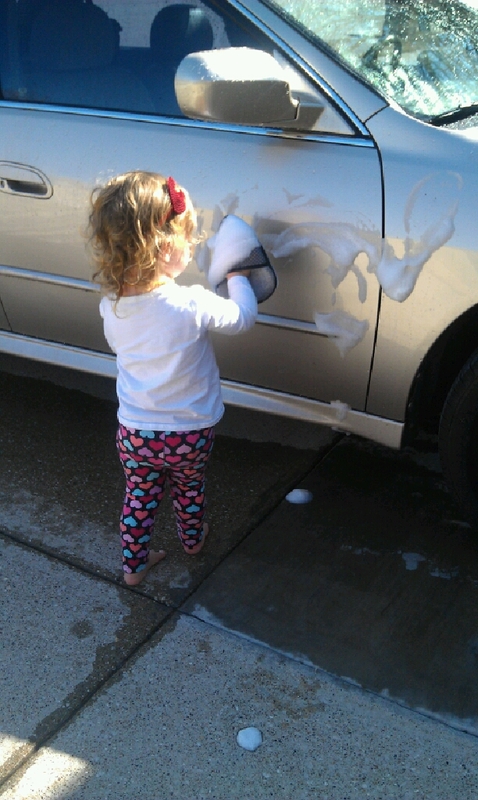 And if you have a gorgeous day like we did, you could always grab a trusty helper and get a few tasks done. I know I’m not typical, but it’s all good. I hope everyone has a great day, whether you celebrate this made up day or not. Do you have any plans or traditions that you do? Are you one of those who celebrate it as Singles Awareness Day? Either way, it’s cool, let’s all get together and JUST EAT!